This was one of those reviews that took me while to figure out how to write. I’ve been running into that more often with indie publications, and after the fact, it’s not too surprising. Traditional publishers have always been a little skittish about what they printed. Now, with rising competition from independent self-publishers, they’re getting even more skittish. Better stick to the tried and true formulas, which means what you find on the physical shelves, unless you delve into the more esoteric literary corners, will follow a proven successful formula. Indies don’t have that restriction; they can go anywhere. They are free to experiment, and that’s a good thing. There are critics that condemn the indie market as being the doom of literature, but I can’t agree with that. I will more likely be its salvation. But as this is the case, it’s not always so easy to just crank out a review. 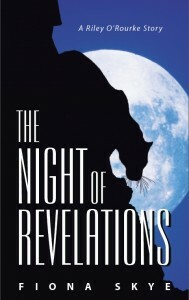 I knew when I downloaded Fiona Skye’s The Night of Revelations that it wasn’t a novel. It was far too short. But it’s not really a short story, either. It took me a while to figure it out, but it finally dawned on me. I can be so slow! It’s a teaser. And it’s really a good tease. Actually, it came with a second teaser, and that was good, too. First off, you just have to like anything with a hero named Riley. I won’t keep quiet that sometimes when she isn’t covering the news she is running around as a Jaguar; the author says that much publicly on her site, so it isn’t a spoiler. What her site doesn’t mention, however, is that Riley’s little secret isn’t the story. Oh, no! I’m old enough to remember when gays started “coming out.”1 They were followed by a wide spectrum of non-binary-gendered folk, who do make the world richer and more colorful. Lately, even some pedophiles have come out, at risk to their life and limb. But I don’t think anyone has ever questioned before what happens when a 3000-year-old vampire decides to come out. And with him, a whole parade of shapechangers and sorcerers that the “normal” world never knew existed. Faced with that possibility, my mind went wild with speculation. Would it mean an end to all-night diners as people worried that going out after dark would put them on the menu? Would that guy start thinking that maybe he had never seen his bowling buddy when there was a full moon? Would there appear signs on fine restaurants saying, “No lycanthropes served here”? Would parents demand normal/paranormal segregation in schools? As it turns out, when I got to Skye’s preview of Faerie Tales, the first of her upcoming Revelations Trilogy, I found that she thought of a possibility that I hadn’t. Suppose not everyone in on the secret wants it made known? Will it mean war? There is so much possibility here that I don’t know has ever been tapped. We’ve read and watched vampires, and werewolves, and secret societies of wizards, and it has always been that they kept their true natures hidden. This might be a first, and I’m eager to see what Skye does with it. Who knows where it might go? We might see urban fantasy take an unexpected turn. She says that Faerie Tales should be out in September. I’m looking forward to it. 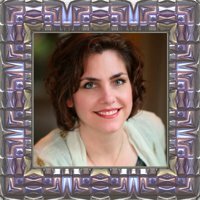 I am so honored–and excited–that you chose to review my story! Thank you for the praise and your thoughts on the piece. You’ve given me some ideas to explore in other short stories that fall in the time period between this and Faerie Tales. So many ideas, in fact, that I might just release an anthology! As an advanced reader of Faerie Tales, I can tell you it only gets better from here! Wait until you meet David and find out his secret–I’m betting neither Publishers nor Hollywood has ever seen anything like it. Oh, and Riley has more secrets yet to be revealed as well. I am blown away by Ms. Skye’s writing–she knows how to tell a tale, and has a fertile and most creative mind! Fiona, glad I could be an inspiration to someone. I’m most curious to see where you take this. I really don’t think I’ve ever seen anything quite like it before.